This property is 100pct nonsmoking Our Orlando Hampton Inn and Suites International Drive is positioned in a prime location for the convenience of our guests. The hotel*s proximity to Orlando*s Convention Center Walt Disney World Universal Orlando SeaWorld Orlando Aquatica Discovery Cove Wet *n Wild Orlando*s World Renown Restaurant Row world class golf in addition to an abundance of dining shopping and entertainment venues is priceless. 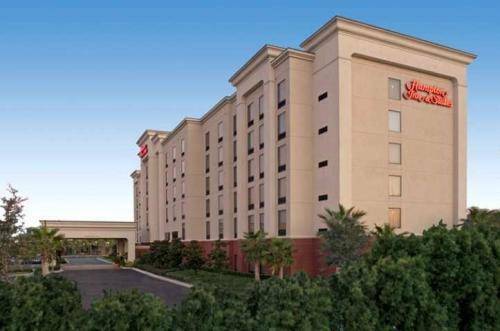 At the Hampton Inn - Suites International Drive hotel in Orlando Florida our guests will enjoy a comfortable and restful night*s sleep in our crisp and spacious guest rooms and suites. Start the day with our delicious complimentary hot On the House breakfast. Our hotel is an interior corridor hotel with refrigerator and microwave in all our rooms in addition plus complimentary high-speed Internet available in you room and throughout the hotel. Host your next Orlando meeting in one of our meeting rooms. The executive traveler will appreciate our guest room accommodations offering a large work desk area two line phones with data port complimentary high-speed Internet and complimentary USA Today delivered to your door Monday through Friday. Our fitness room is ready for your next workout and then you can head to the outdoor heated pool to relax. If you are heading out for the evening several restaurants on the *world famous International Drive* are within walking distance of the hotel. We love having you here at the Hampton Inn - Suites Orlando International Drive hotel in Orlando Florida. ALL RESERVATIONS MUST BE CANCELLED 24 HOURS PRIOR TO HOST TIME UNLESS DEPOSIT REQUIRED IF THIS RESERVATION HAS BEEN MADE ELECTRONICALLY PLEASE CANCEL IT ELECTRONICALLY TO AVOID CONFUSION AND A NO SHOW BILL. Policy subject to change.